Protesters chant outside the House and Senate chambers Friday as police stand by. Four months after activists were arrested while interrupting Gov. 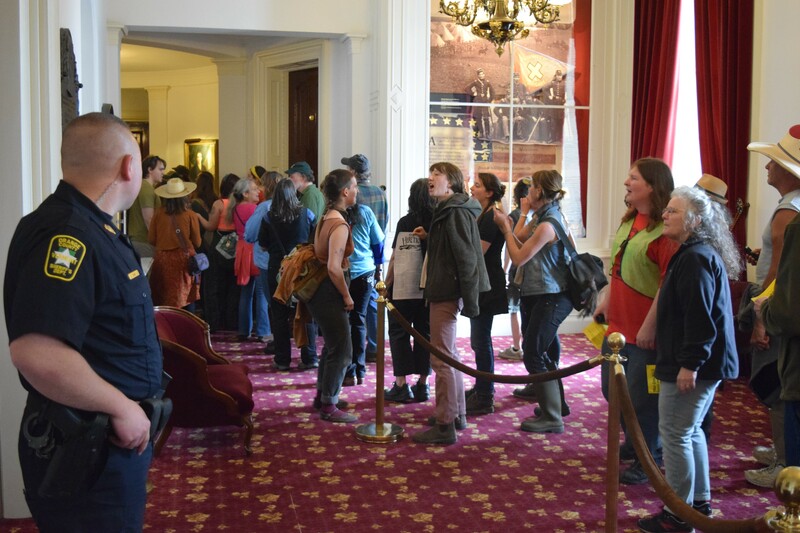 Peter Shumlin’s inaugural, Statehouse police were on high alert Friday as May Day protesters streamed into the building. Both the House and Senate were in session Friday afternoon when about 50 chanting protesters passed through. Statehouse security officers stood in front of the House and Senate chamber doors, ready to deny protesters entry. “Hey, hey, ho, ho, white supremacy has got to go,” protesters chanted as they passed the legislative chambers carrying signs that touted a variety of causes. Their noise prompted the Senate to temporarily stop action. A school group ducked into the Senate chamber to avoid the protesters. No protesters tried to enter either the House or Senate chambers. Officers never confronted them and no arrests were made, Miller said. Protesters pass by the Senate chamber as Senate President Pro Tempore John Campbell and Sergeant-at-arms Janet Miller look on. Though the protests were far milder than those at the inaugural in January, some legislators were irritated that protesters were allowed in the Statehouse at all. Keith Brunner, spokesman for the Vermont Workers Center, which organized a May Day rally on the Statehouse steps, said protesters had no plans to get arrested this time. But, he said, they wanted to make their feelings known. 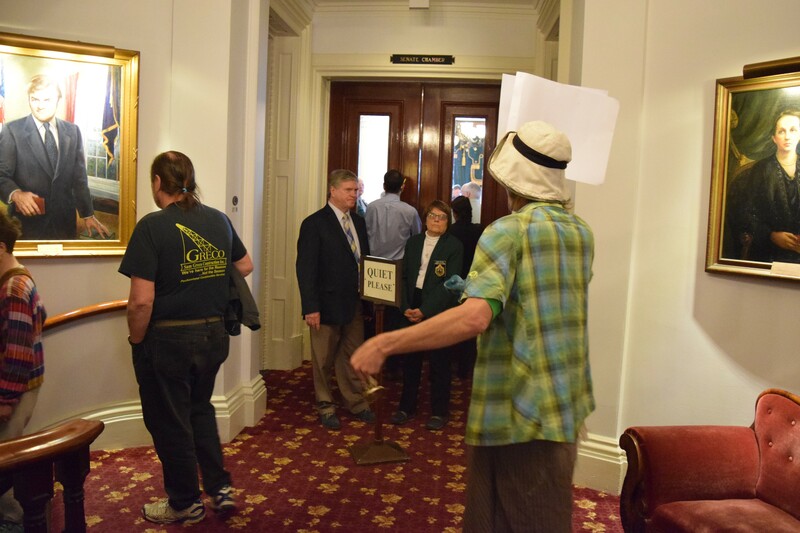 “The general perspective is people are pretty disillusioned with what’s going on in the Statehouse,” Brunner said, referring to budget cuts and Shumlin’s decision not to pursue universal health coverage. Protesters chose not to stay inside the Statehouse very long this time before heading back outside for a more traditional rally on the lawn. By contrast, 29 protesters were charged with trespassing in January when they refused to leave the House chamber.